* If you are under the age of 21, please imagine the word “Soda”, or maybe “Milk”, instead of beer. Thanks! 1) First I crammed all the guts inside an Atari 2600 case and squished it together. It *pretty much* fit so I knew this project would possibly work. 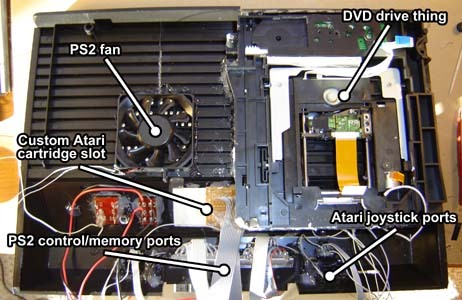 The DVD drive has the front piece of the Atari super and hot glued to it. The drive itself was then superglued to the case. I had to make a circular holder thing for the magnetic disc clamp do-hickey (not shown). The “magnetic disc clamp do-hickey” is what clamps the DVD to the drive motor. So technically you could sit this system sideways, but why on earth would you want to? 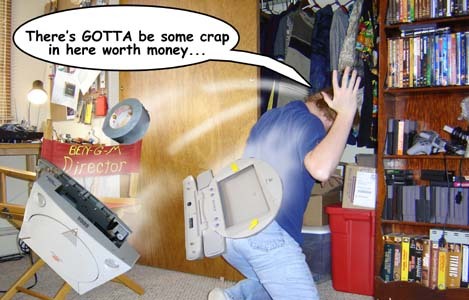 Using an original Atari 2600 cartridge slot wouldn’t work because it’d bump against the DVD drive. Therefore I used a brand-new 24 pin card edge connector (thanks Digi-key!) 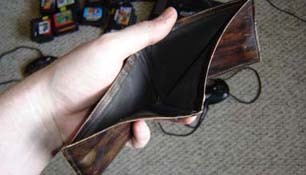 and made a custom cartridge slot that doesn’t sink in as far. The Atari joysticks are in the normal places. The PS2 controller/memory brick (as I call it) is placed in a hole between the joystick ports. 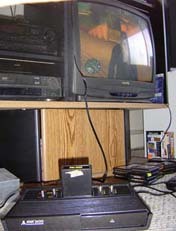 This was assembled in steps, I mounted the PS2 board first, made sure it and the DVD drive worked, then installed the Atari. As everything is hot glued together it’s hard to go backwards and fix things. So it’s good to get it right before continuing. Naturally I used a 4″ x 4″ hacked Atari 2600 motherboard. There’s 3 potentiometers to adjust the video (just off lower left of board) These line up to one of the holes in the bottom of the case so the user can adjust the Atari’s picture without ripping the thing apart. How handy! 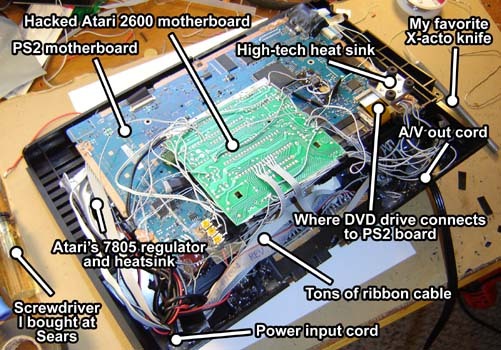 The “tons of ribbon cable) go from the PS2 controller/memory ports to the front of the PS2 board (near the words “PS2 Motherboard”) where the controller connections originally were. I don’t mind using all this ribbon cable, it’s usually free if you find a computer store that likes to get rid of junk. Now with everything assembled, let’s see how the system is used! First you plug in the external power supply. 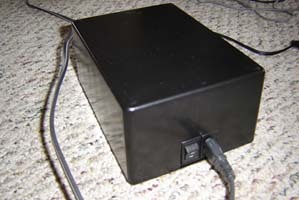 This box contains the original 110 VAC – 12 volt DC power supply from the PS2. The cords are long so you can hide it behind a speaker or something. Flipping the switch ON allows power to the system itself. Next up are the controls. Note how some are double function. All the switches in the Atari are DPDT so creating isolated circuits with them is easy! This story has a happy ending. I sold the unit and bought some beer. Mission accomplished!